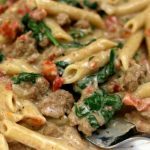 Saucy penne pasta with ground turkey, tomatoes, green chiles, cumin, cream cheese and spinach. Make it fast in the electric pressure cooker. Brown the turkey. Turn your Instant Pot to the saute setting. When it says HOT on the display add the olive oil into the pot. Swirl the oil around. Add in the ground turkey and break it up with a wooden spoon. Add in the onion. Stir. Add in the salt, garlic powder, cumin, oregano and pepper. Brown the meat for about 5 minutes. There will be extra liquid that cooks off of it and that is okay. We will use it to help cook the pasta. Pressure cook. Pour in the penne pasta, broth, tomatoes, salt, pepper, cumin and chili powder. Don’t stir. Cover the pot and secure the lid. Make sure valve is set to sealing. Set the manual/pressure cook button to 4 minutes. Once the time is up perform a quick release by moving the valve to venting. Remove the lid. Finish the dish. Turn the Instant Pot to the saute setting and stir in the cream cheese, spinach and cheese. Stir until the cream cheese is melted and fully incorporated. Turn off the saute setting. Scoop the pasta onto serving dishes and enjoy. You can also make this with lean ground beef or chicken. Feel free to use whatever pasta you like best. To figure out how long to cook your particular pasta in the instant pot check the back of the pasta box. Divide the number of stove top cooking minutes in 2 and then subtract one minute. For example if the pasta says to cook for 10 minutes you’d divide 10 by 2, which is 5, and then subtract 1, which is 4 minutes in the instant pot. To make gluten free: Double check your broth to be sure it does not contain gluten. Substitute noodles for GF noodles and decrease cook time by 1 minute.